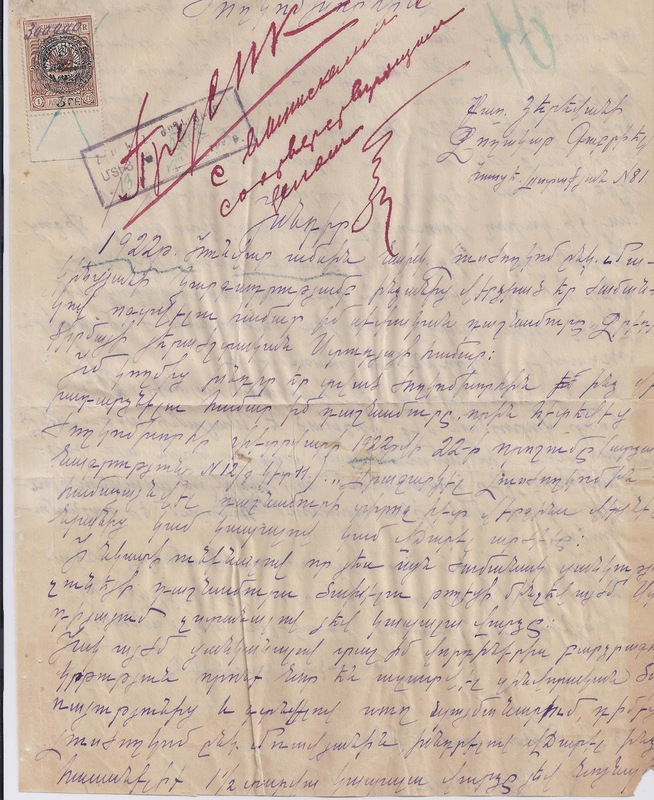 When I looked at this 1923 document, written in Armenian, I immediately concluded it was genuine in all respects on the basis of an entirely incidental feature. 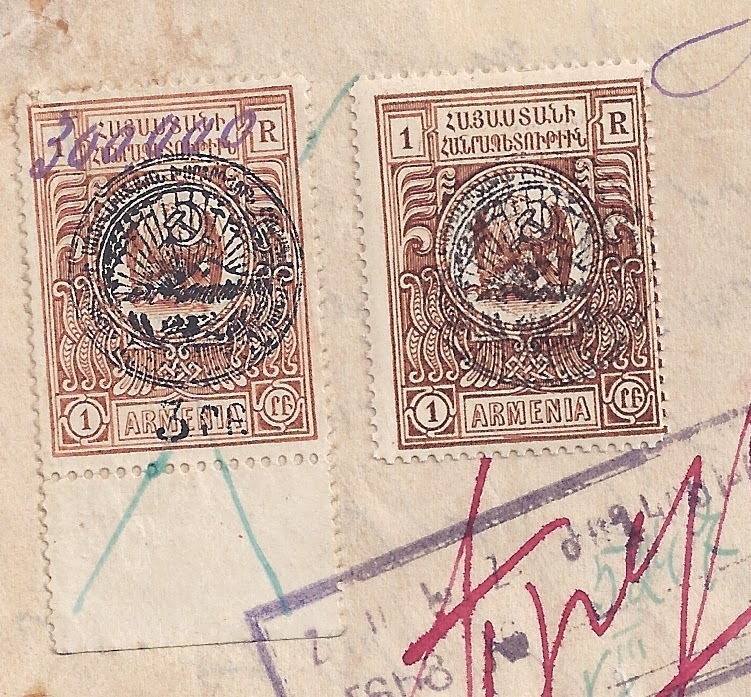 The 1 rouble Chassepot stamp was overprinted with Soviet Armenia's Arms and simultaneously revalued to "3 rf" (Zakiyan # 17) and then revalued again in ink "300 000" (Zakiyan # 25). 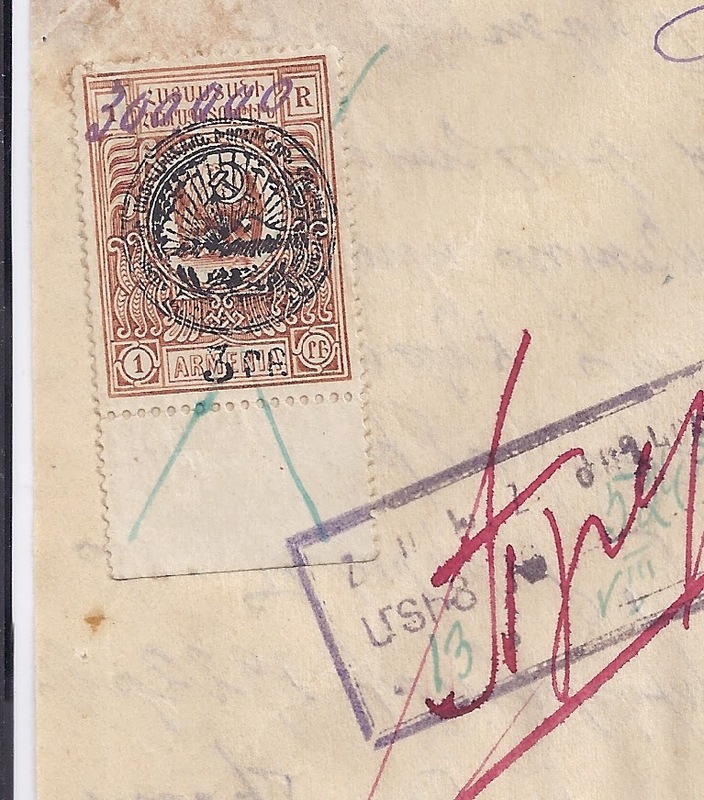 It was applied to the document probably on 13 August 1923 - the date in blue - green ink inside the boxed violet cachet at the top left of the document. The same blue-green ink pen cancels the stamp. It's also the case that the 1 rouble Chassepot is the most common of the fiscally used Chassepots and often occurs as a single franking. Multiples are not very common. For this reason, it would be very difficult to plate this issue and I do not think any collector or Expertiser has attempted it. But in an ideal world, an Expert would be able to Plate the stamp on this document as part of a demonstration that it is genuine and genuinely used. Most or all of the ink revaluations appear to have been carried out in batches rather than at the point of the stamp's use, and so only a limited number of inks are found - the violet ink of this revaluation being one of them.